E-Verify is a part of everyday life for most hiring managers. But, there may be some aspects of E-Verify that many employers don’t know about. For instance, have you heard about E-Verify’s RIDE program? How about E-Verify’s self-check or employer database? These lesser-known programs offer certain features that may be of interest to both employers and their applicants. Let’s take a look. The Records and Information from DMVs for E-Verify RIDE program was developed by the U.S. Citizenship and Immigration Services (USCIS) to validate the authenticity of applicant’s driver’s licenses used by employers as Form I-9 identity documents. Even more, over 80 percent of applicants using their driver’s license to establish their identity when completing the Form I-9. The goal of this program is to decrease instances of document fraud and promote a legal workforce. In states where the RIDE program has been implemented, an applicant’s driver’s license data is compared to state records, thus confirming authenticity. When presented with a driver’s license, employers are simply asked to enter the license number and expiration date into the E-Verify system. This will automatically check the information against state records. The RIDE program does not display the driver’s license photo. The information will be checked for validity and a tentative non-confirmation will be issued if the information does not match. RIDE is a voluntary program which four states currently participate in Mississippi, Florida, Idaho, and Iowa. Employers are affected by the RIDE program when employees present a driver’s license from any of these four states. Regardless of where the employer is located. For instance, if an employer participating in E-verify program was located in Pennsylvania and had a new hire with an Iowa driver’s license, the employer would be prompted to enter the new hire’s driver’s license information and that information would be checked against state records as a part of the E-Verify process. Learn more about the E-Verify RIDE Program. E-Verify self-check program allows workers to check their employment eligibility in all 50 states, Washington D.C., Guam, Puerto Rico, the U.S. Virgin Islands, and the Commonwealth of Northern Mariana Islands (no less!). The ability to self-check one’s status allows individuals the ability to view and correct any errors that may occur within the system prior to being active. Use of this program leads to fewer instances of tentative non-confirmations and therefore helps to speed up the hiring process for certain applicants. Learn more about the E-Verify self-check program. Additionally, E-Verify offers a free search tool which allows individuals the ability to search and view profiles of employers who currently use the E-Verify program. This E-Verify Employers Search Tool offers a user-friendly search tool allows the public to search for businesses using one or all of the search parameters including employer’s name, city, state, and/or zip code. Also, the search tool allows the user to filter results according to federal contractor identifier (y/n), federal contractor employee verification, and workforce size. Although the system offers many benefits, users may experience a few bumps in the road. There are instances where employers may not show up in the database. For starters, the database only contains employers and federal contractors who have self-reported their company of five or more employees. Secondly, not all business locations will arise. Employers provide a single contact address as well as the address where the employers conduct E-Verify searches. Regardless of the number of company locations they may have. Similarly, employers may be difficult to locate because they register with E-verify under their legal name. This may differ from their more widely known trade name. Try the E-Verify Employers Search Tool today! 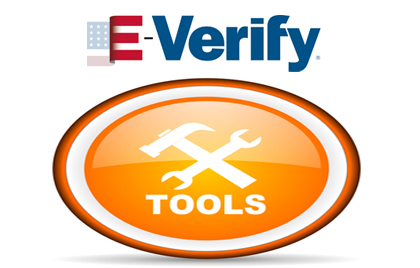 E-Verify Employers Search Tool. According to the USCIS, there are currently half a million employers using E-Verify, at 1.5 million worksites. Several states have mandated the use of E-Verify and much more have pending legislation. For more information on E-Verify or Justifacts Electronic I-9 System, please contact us at (800) 356-6885 or email us at Sales@justifacts.com.